The Friends of NELHA which offers public presentations about activities at NELHA has a new regular attraction. 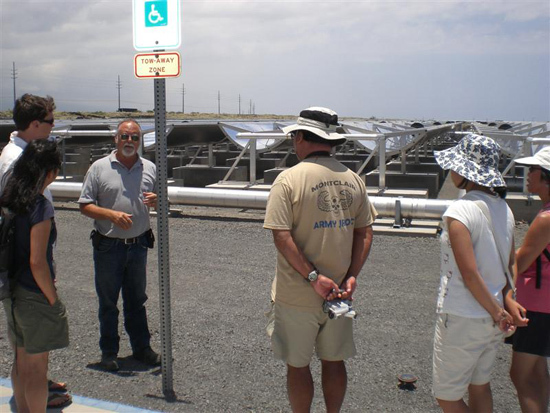 Each Tuesday right after the “Energy in Hawaii” presentation, guests now have the option of taking a tour of the Keahole Solar Power project located on the Gateway Center grounds. “Many people stop by the Hawaii Gateway Energy Center daily curious of the various solar projects we have on site. These tours allow guests to get a close up perspective of the project scale while getting answers to their questions by the staff,” said Guy Toyama, executive director of Friends of NELHA. The “Energy in Hawaii” presentations with tour begin at 10 a.m. at the Gateway Center Visitor Center every Tuesday.